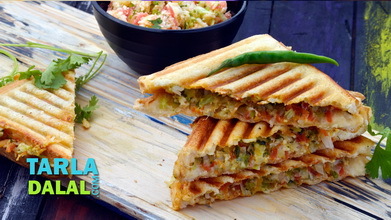 Here is an enjoyably cheesy sandwich with the peppy punch of capsicum, the tangy touch of tomatoes and the sweet spell of corn! 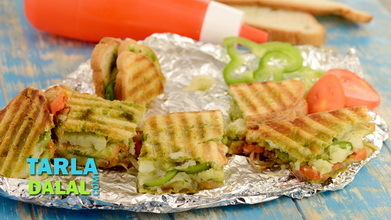 This grilled sandwiches indulges you with loads of cheese, inside and outside, which goes very well with the assortment of crunchy and tasty veggies. 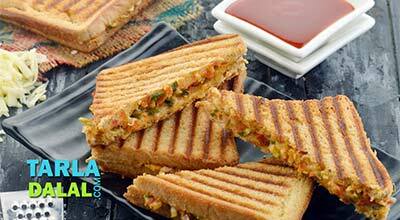 A dash of mustard powder spikes the aroma and taste of the Cheesy Corn Grilled Sandwich, making it a real treat for your palate. 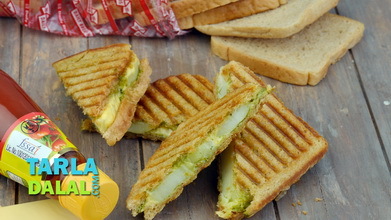 As there is a lot of cheese in this attractive grilled sandwich, make sure you relish it immediately after preparation to enjoy the best texture. 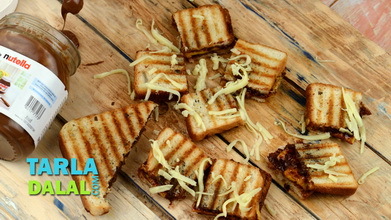 This sandwich is quite cheesy… there is cheese in the stuffing and also on top. 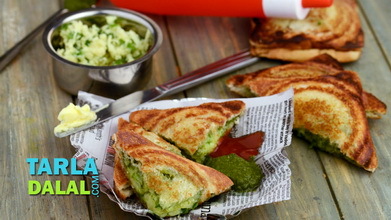 Heat the butter in a broad non-stick pan, add the onions, coloured capsicum and 1 tsp of green chillies and sauté on a medium flame for 1 to 2 minutes. Add the corn, tomato, cheese, salt and mustard powder, mix well and cook on a medium flame for 1 to 2 minutes, while stirring occasionally. Divide the mixture into 3 equal portions and keep aside. Apply 1 tsp of butter on each bread slice and keep aside. 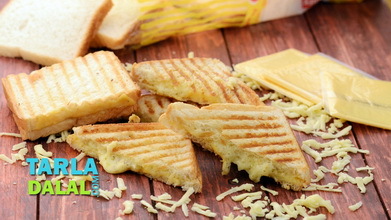 Place a bread slice in a pre¬heated sandwich griller with the buttered side facing downwards. 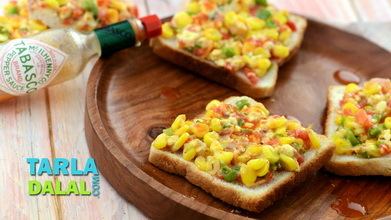 Spread a portion of the corn mixture and sprinkle 1 tbsp of cheese and ¼ tsp of green chillies evenly over it. Sandwich it with another bread slice with the buttered side facing upwards. 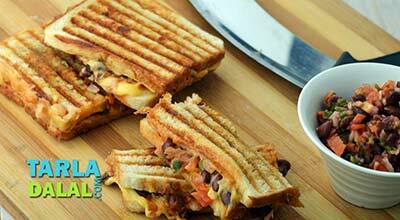 Grill the sandwich for 5 to 7 minutes or till it turns crispy and brown from both the sides. Repeat steps 5 to 8 to make 2 more sandwiches. 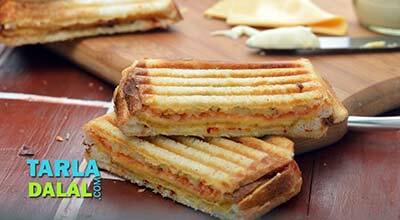 Cut each sandwich diagonally into 2 equal pieces and serve immediately.